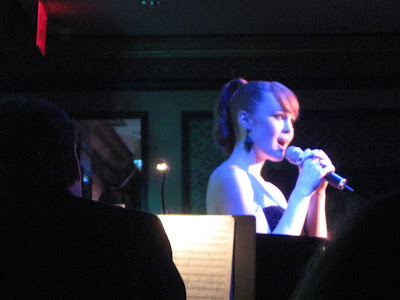 FINIAN'S RAINBOW: NEW BROADWAY CAST RECORDING/CD It was another dream evening at Feinstein's last night when Kate Baldwin performed her first cabaret. If she hadn't have prefaced the evening with that fact, we would have never known it. Kate performed Yip Harburg and Burton Lane songs from her debut solo about, Let's See What Happens, plus some. This album is my favorite new cd of the year, perhaps of the decade. Dressed in a strapless black evening gown, it was as if Kate stepped out of Big Band 1940 just like I imagined when I first gave the album a listen. If possible, she looked more glamorous and beautiful to ever, right down to her sparkling Jimmy Choo's. Seeming perfectly at ease in the full room, Kate brought her gorgeous voice, capable of evoking a tear one moment and provoking a grin the next, to the evening. She mixed in a dose of her down to earth personality and quirky sense of humor. Performing all Lane and Harburg tunes meant also throwing in a delightful cover of the Merry Old Land of Oz that had us rolling in the aisles. She encored the evening with How Are Things in Glocca Morra, a song she was born to sing. For years I pined for Kate to have a leading lady role on Broadway. 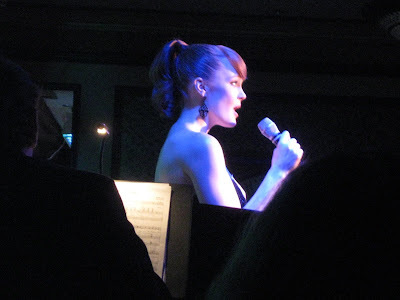 Much to my delight, between her lead in Finian's Rainbow, the only show so far this season to garner raves across the board, her fabulous album and this cabaret, it's finally, the Season of Kate Baldwin. She's a dream come true and Broadway finally has the first star in a very, very long time, worthy of outshining the Great White Way.